2016 Cross Nationals Race Predictor Throwdown! I distinctly remember Steve Johnson telling me that if we didn't agree on a price for selling crossresults to USAC that they would copy it. And they did! Like, all of it ...to the best of their ability, which means it's a reasonable facsimile of crossresults now, but not an exact clone, and that clone also has a "race predictor." (I like the part where they didn't change the name). In any case, now we live in a magical world with no less than TWO competing mathematical predictions for the United States Cyclocross National Championships! Amazing times we live in. Let's check it out. 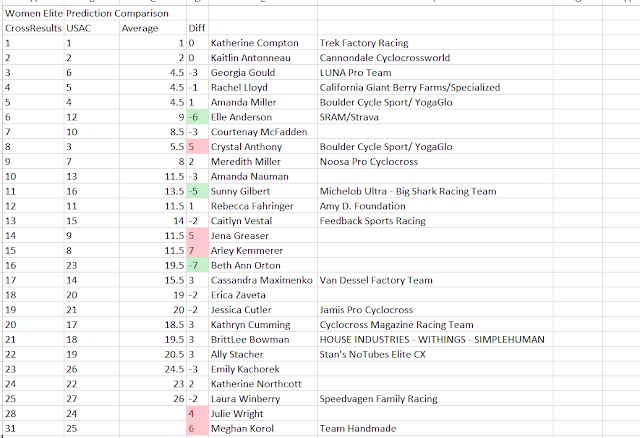 There's also some less obvious stuff in the algorthims involving biases in the systems that try to adjust (or not adjust) for masters and juniors, and crossresults gives higher points to women because I am a sexist pig, but those are the highlights. On to the predictions! Both algorithms agree: the Katies are still the queens. 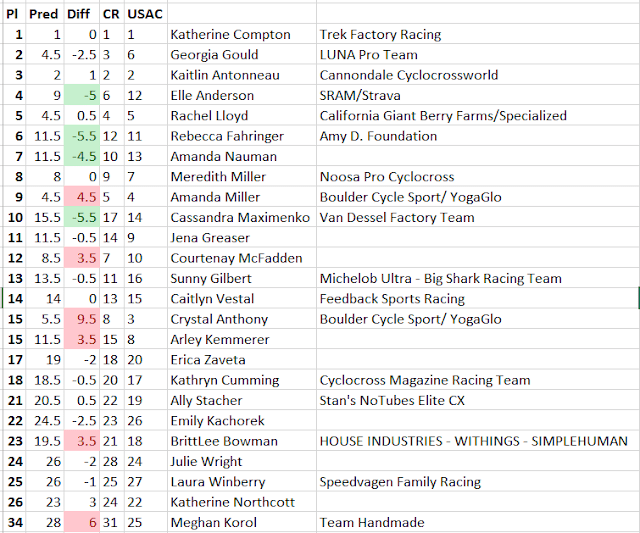 The biggest difference at the top is that USAC has Crystal Anthony on the third step of the podium, while crossresults places her 8th, based on a string of less-than-stellar results in Europe. Meanwhile, crossresults puts Georgia Gould onto the 3rd step based on her meager but successful racing season in Colorado this year. Personally, I think both Crystal and Georgia are being overrated by algorithms, and the American podium will be filled out by Amanda Miller, Elle Anderson, and Meredith Miller, all of whom showed good form in Europe over Christmas at one time or another. Rachel Lloyd makes the top five in both algorthims, but hasn't raced since November, so I'm afraid to pick her for a top five. But Asheville is not Europe and predictions are fundamentally silly and yet HERE YOU ARE ANYWAY. The story this year has to be the rise of Stephen Hyde, as Jeremy goes into nationals with a legitimate challenger for the first time in a few years. Crossresults actually puts Stephen ever so slightly ahead of Jeremy based off recent results in Europe, but it's close enough to be called a tie in practice. USAC agrees on those two at the front, but one difference that doesn't come through here is that they have third place (Jamey Driscoll) close behind, while crossresults says the drop to 3rd place is eighteen points (12%!). So crossresults sees a two-man battle, and then a wide open race for 3rd, while USAC sees the entire podium as being much closer. 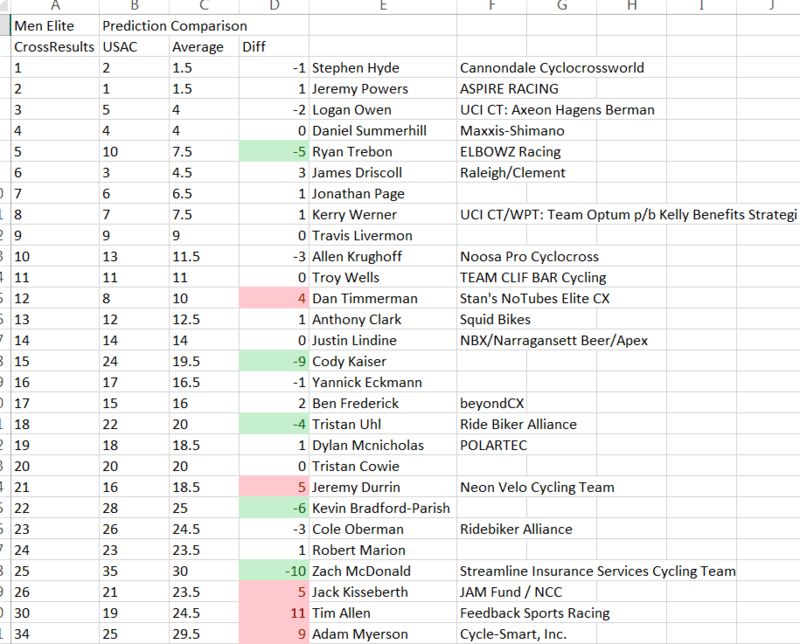 Crossresults (and my gut) think Logan Owen pulls off third place, while USAC likes Jamey Driscoll -- who had won 6 UCI races in a row before dropping to 7th at Kingsport -- to get third. 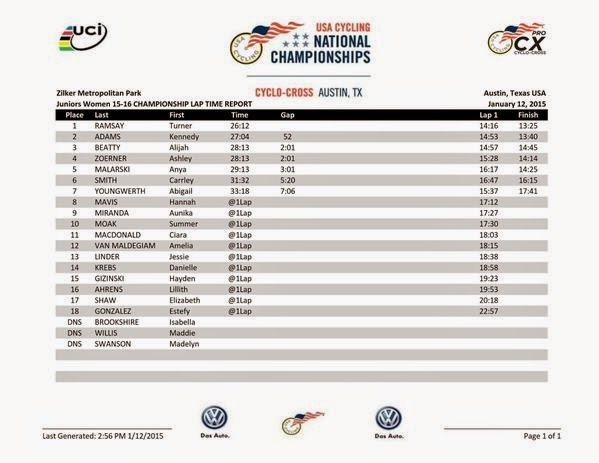 The big difference in the top 10 is Ryan Trebon (who has struggled with injury and hasn't logged a finish since early November) -- crossresults has him 5th, while USAC places him 10th. 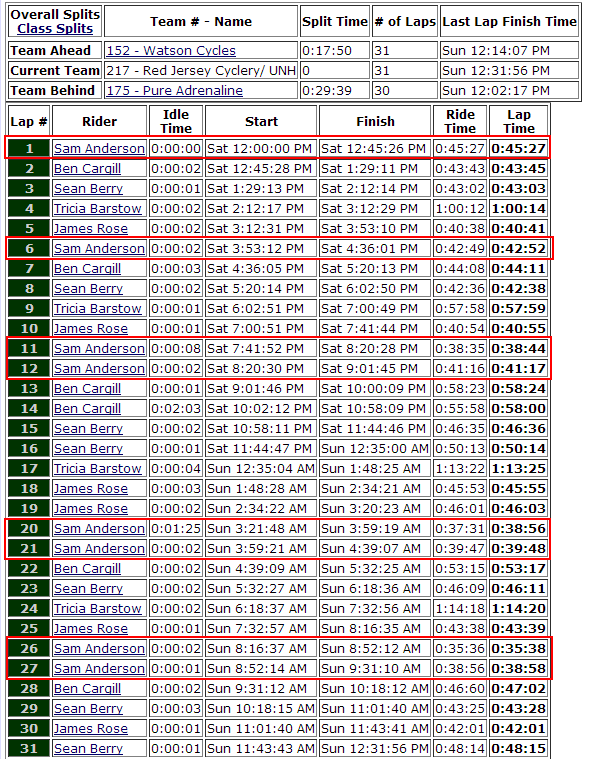 As much as I'd like to see a big performance from Ryan, I think USAC's position is more accurate. Ryan was putting in solid results before dropping off the scene, so his points are good, but there's no adjustment in the data for "hasn't raced in weeks and made a Facebook post about his injury struggles." My personal pick for 5th is Travis Livermon, who quietly put in some very respectable rides in Europe over the past few weeks. And I agree completely with crossresults that Hyde/Powers is too close to call -- but if I had to do it, I'd pick Hyde right now. For the second year in a row, crossresults doesn't think Myerson will get it together for a lead lap finish at Nationals. Personally, I think he goes out in a Flynnstagram-fueled blaze of glory and finishes way better than 34th in the last race of his career. I maintain that predictions are fundamentally silly. Give me a race with an undecided podium heading into the last lap and I'm happy, even if all my predictions are wrong. ** Can we talk about how crazy ZMD's nationals results have been? 2nd in 2013, DNF in 2014, 3rd in 2014, predicted ~30th in 2016? no USAC races...any person with any points is predicted to win! I have to get you the code to visualize these.. I wish I had a better data vis tool than Excel that I was comfortable using. Recommendations? We have Page in 7th buddy! You did have the women's 60-64 reversed but we will forgive you if you put the results up and Karen gets credit for the win. Nice to see the 0 wins changed to a 1 since it was the Nationals. Thanks very much for doing and sharing this great work. Any plans to post an after-the-event comparison of the accuracy of the two sets of predictions? Also, on visualization, if you ever want some ideas or assistance making charts or an interactive page in R, I'd be happy to pitch in. I do this for a living on other topics but would rather be thinking about bike racing.